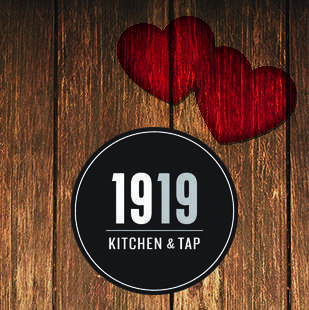 Love is in the air at 1919 Kitchen & Tap all week long! Make your reservation today, and enjoy a Valentine's Day special that our Chef's put a lot of love in creating! We will be featuring these specials from Saturday, Feb 10 through Valentine's Day and into Saturday, Feb 17. Come out and try the Sauteed Shrimp with a roasted garlic sauce, fettuccine, snap peas, white wine poached tomatoes and roasted butternut squash. Or if your more turf than surf, we will also be offering a tenderloin steak with king trumpet mushrooms, smashed purple potato fingerlings, glazed baby carrots & broccolini, with cognac demi and garlic chips. Join us on Valentine's Day and enjoy our hand crafted dessert duo featuring mirrored cheesecake and a large macaroon.